NEW YORK (AP) -Nigel Dawes knew just where he wanted to put the puck in the shootout, even though Boston's Alex Auld hadn't shown a single weakness in a brilliant goaltending duel with Henrik Lundqvist. After watching New York teammate Brendan Shanahan get stopped by Auld on the first attempt in the tiebreaker, Dawes found the net in round two and lifted the Rangers to a key 1-0 victory over the Bruins on Sunday. "I was just thinking about trying to get the puck past him. He played an unbelievable game," said Dawes, who scored in a shootout for the third time in four games. "I just wanted to find an opening, and the first thing that popped out at me was low blocker." Whatever the plan was, it worked and it gave the sixth-place Rangers a one-point lead over Boston with 13 games remaining for both teams. New York is third in the Atlantic, but only five points behind New Jersey for the lead in both the division and the Eastern Conference. Dawes scored the lone goal in the tiebreaker and helped the Rangers salvage one game in the four-game season series with the Bruins (1-1-2). New York is 9-0-3 in its last 12 and 14-3-3 in its previous 20. Through regulation, Auld made 34 saves. 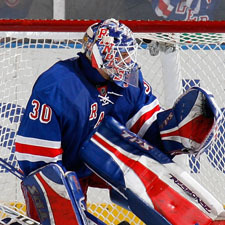 He was matched by Lundqvist, who stopped 27 Bruins shots. Boston held a 2-1 edge in overtime. 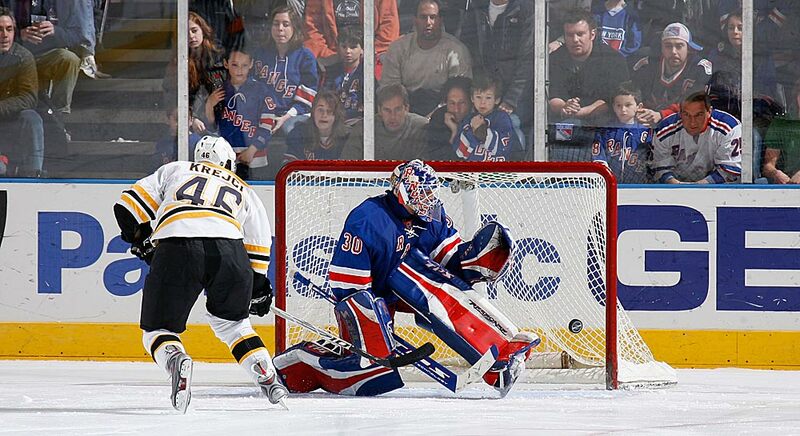 Lundqvist turned aside Marco Sturm, Phil Kessel and David Krejci in the shootout. Kessel had scored in each of the Bruins' two shootout wins this season over New York in Boston, including a 1-0 win in October. "It was fun to play and it felt really good to finally beat them in a shootout," said Lundqvist, who battled fatigue and a sore throat but earned his 16th NHL shutout. "They had a couple of good players who made a couple of good moves. It was a big statement for us to beat this team." The Bruins knocked off the Rangers 3-1 in January at Madison Square Garden, marking the first time New York failed to earn a point against Boston in 11 games (8-1-2). Lundqvist has eight shutouts this season. Auld posted his third. Auld played in a fifth straight game, including a pair of relief appearances for Tim Thomas, who gave up 12 goals on 47 shots in losses this week to Washington and Toronto. Thomas earned two of Boston's three wins over the Rangers this season. Auld kept the Bruins in Saturday's 2-1 victory in a rematch with Washington, holding the fort until Boston scored a pair of 5-on-3 power-play goals in the closing minutes. The tying goal Saturday came off the stick of captain Zdeno Chara, but the 6-foot-9 defenseman didn't make the trip to New York because of an undisclosed injury that sidelined him for part of the win. The Bruins, who played three games in four days, are 1-2-2 in their past five. They also lost 1-0 in overtime to Florida on Tuesday. "It was a hard-fought game," Auld said of the latest loss. "It would've been nice to come out ahead of them, but it was a big point for us, too. Auld proved to be as stingy as Thomas against the Rangers, stopping seven shots in the first period and then 16 more in the second. "There's no doubt that he helped us get that point, and probably the main reason we got that point," Bruins coach Claude Julien said. Chris Drury had two prime scoring chances in the closing two minutes of the first during a Rangers power play. Auld blocked a quick shot from in front and then got bailed out when Drury's drive clipped the crossbar. Sean Avery also found the crossbar in the third, and Scott Gomez shot wide after defenseman Andrew Ference turned over the puck to him right in front of Auld. Lundqvist was sharp in his first outing since earning his 30th win of the season Thursday with a 26-save effort against the New York Islanders in a 4-1 win. Lundqvist, making his 10th straight start, turned aside Sturm in front shortly before the midway point of the second and then stuck his glove out to snag defenseman Dennis Wideman's drive late in the period during the first of Boston's two power plays in the frame. In the third, he dived across the goal line with his glove to keep out Glen Metropolit's shot. Then he stood tall to block Krejci's drive. Notes: Lundqvist joined Ron Hextall as the only NHL goalies to earn 30 wins in each of their first three seasons. ... Manny Fernandez made 26 saves in Boston's 1-0 shootout victory Oct. 20. ... Julien said Chara's injury is expected to be short term. He is day-to-day.